As you can tell from the photo, you don’t make this dish for its looks. It’s not pretty. (I served it alongside some sautéed spinach for color and nutrients. That, and we like spinach with just about everything.) Despite the name, this is not a bowl of noodles with curds of scrambled egg scattered over. Instead, the eggs and pasta meld with the buttery shallots and garlic as they cook, creating a harmonious whole. We learned about this dish on the Food Network’s “The Best Thing I Ever Ate.” If you haven’t seen it, chefs describe, in rapturous tones, their favorite food in categories such as Fried Foods, Holiday, or With Bacon. As you’d imagine, many of the dishes make you want to be instantly transported to that restaurant (Michael Symon’s chocolate bacon cake had me drooling for days). Alas, no recipes are provided for these delights. On the Breakfast episode, chef Susan Feniger introduced me (and all the other FN viewers) to her go-to morning dish: scrambled egg pasta. Chef Susan loved it, it looked fantastic, and most importantly, it seemed easy to re-create. So Luke and I headed to the kitchen for a little experimentation. The premise is simple: sauté some minced shallot and garlic in butter, add cooked spaghetti to the pan, pour some beaten eggs over, stir frantically, add a handful of parmesan, and you’re done. This works best with long thin pasta, so you achieve the best pasta-to-egg ratio. We are very fond of nutty, full-flavored buckwheat soba noodles. They cook in just a few minutes, so it’s important to have everything ready to go before you start the pasta. It would indeed be a terrific way to start your day, but we’re more of the cereal/toast types at breakfast, so we make it for lunch. It’s also a great fast dinner, loaded with protein and healthy carbs, for my athlete son. Scrambled egg pasta is easy to adapt to any number of servings; Luke makes it with one egg for himself sometimes. But this is a rare dish that I don’t fool around with much. We found that it’s just not the same if we add extra ingredients or fiddle with the cheese. That shouldn’t stop you, of course; let me know if you find a variation that works for you. Put a large pot of water on to boil. Meanwhile, melt the butter and oil in a large skillet. Add the shallots, garlic, and pepper flakes. Sauté for a few minutes until the shallots are soft and translucent. Sprinkle with salt and pepper and turn heat to low. Beat the eggs in a small bowl. Have the eggs, herbs and parmesan close at hand. Put the pasta in the boiling water and add two or three hefty pinches of salt. When the pasta is just about done, turn the heat under the pan with the shallots back up to medium. As soon as the pasta is perfectly cooked, drain it, saving about a half-cup of cooking water. Put the pasta into the shallot pan and stir well to coat the pasta with the oil-butter-shallot mixture. Add a few tablespoons of the pasta water. Pour in the eggs and stir very quickly to distribute them well. Add a handful of parmesan and keep stirring. Cook until the pasta is coated and the eggs are cooked. The whole process will take a minute or two at most. Put the pasta on plates, sprinkle with the herbs, and serve at once, passing extra parmesan. 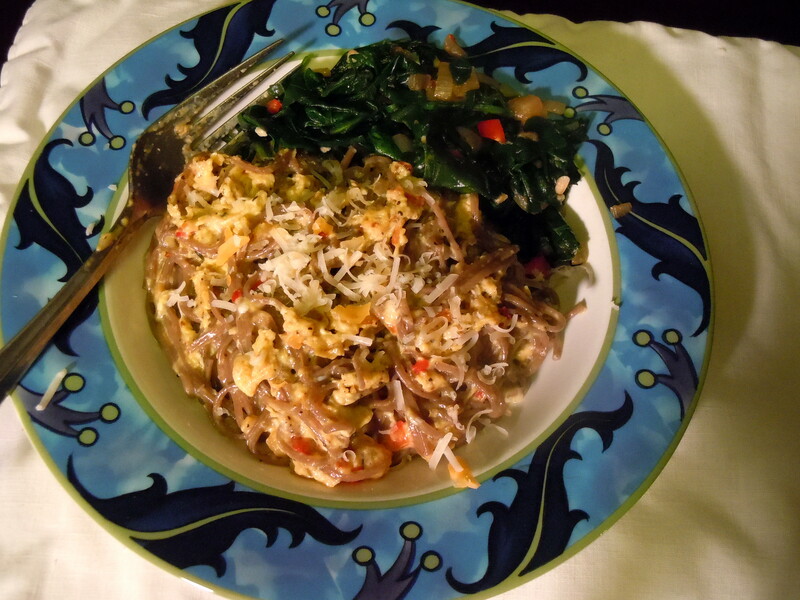 This entry was posted in main courses, pasta, rice, and grains and tagged breakfast, eggs, healthy, pasta, scrambled eggs, soba noodles. Bookmark the permalink. Whoa….this is a really good idea and looks very yummy. This looks absolutely wonderful. Great combination. This looks fantastic and delicious. Are you kidding? It’s beautiful! Looks so nutritious! Thanks, Jennifer. It is actually healthy: the soba noodles are whole grain (buckwheat), the eggs have protein, and there’s very little added fat. Even the parsley contributes vitamins.